This is another show or display approved car, that is now over 25 years old, exempt from NHTSA import requirements, and over 21 years old so its EPA exempt in its original configuration. 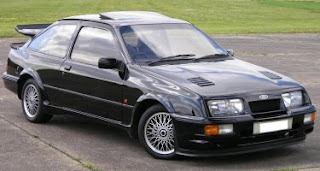 The RS500 was a specialized version of the Ford Sierra Cosworth RS. Only 500 of them were produced, and the basis for a lot of race cars. "After finishing the 5000 production cars, Ford produced another 500 units of evolution according to the racing rules. This was the RS500. I was fortunate to see one of them on the road many years ago. 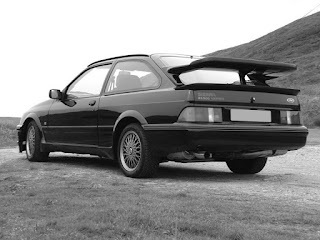 It distinguished from the regular RS Cosworth by an additional boot spoiler, a larger whale tail and an additional air intake on the top edge of the front bumper. In motor racing, RS500 was a formiddable player in its time. It won World Touring Car Championship in 1987 and European Touring Car Championship in 1988. If not FIA imposed weight penalties to stop it from winning, it could have achieved even more success. " If you think it might look a bit like a Merkur XR4Ti, then read on. "Many of the suspension differences between the standard Sierra and the Cosworth attributed their development to what was learned from racing the turbocharged Jack Roush IMSA Merkur XR4Ti in America and Andy Rouse's successful campaign of the 1985 British Saloon Car Championship. Much of Ford's external documentation for customer race preparation indicated "developed for the XR4Ti" when describing parts that were Sierra Cosworth specific. Roush's suspension and aerodynamics engineering for the IMSA cars was excellent feedback for Ford. Some production parts from the XR4Ti made their way into the Cosworth such as the speedometer with integral boost gauge and the motorsport 909 chassis stiffening plates"